Whilst modern LEDs are very bright for the amount of power they consume, these pixels are still power hungry. If your power supply is underweight you will start to see a whole plethora of problems. Your pixels will not just be dimmer, they will start failing after a certain point. As an example, a single SK9822 pixel will consume 20mA per LED. Take note that each of these pixels have 3 LEDs inside. So each PIXEL can consume a total of 60mA at full brightness. How does this convert into usable numbers? 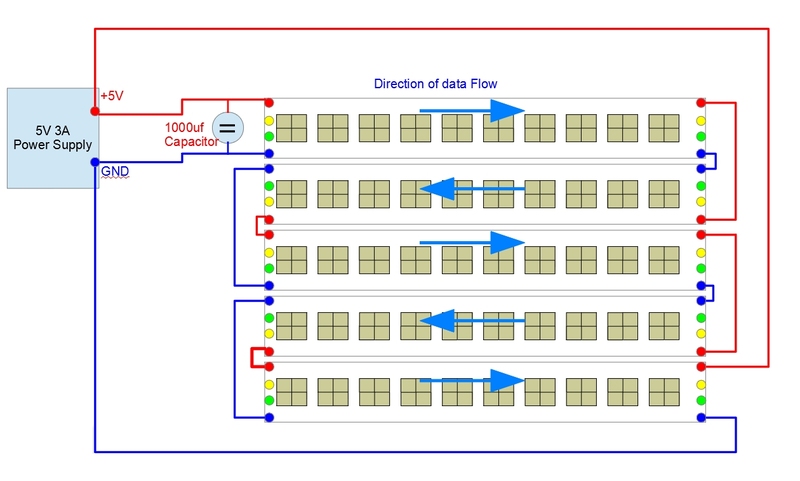 It is important to connect the GROUND pins of every strip you use in your project to the same ground strip of your driver, whether it be a micro controller or an off the shelf device. When building large installations often you will have more than 1 power supply powering your strips. It is important to have a common ground plane between all power supplies. Never connect the +V terminals of any power supplies together! 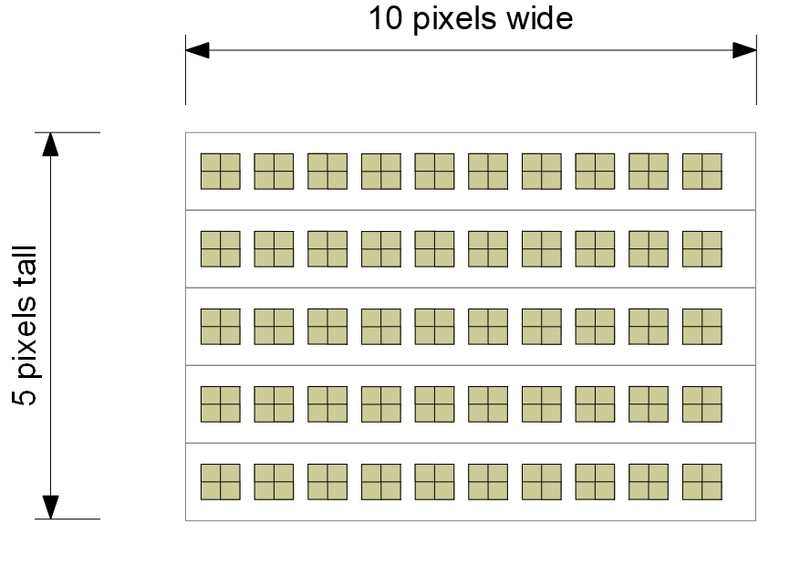 Above we have laid out 5 strips with 10 pixels each. The power is chained from one strip to the next. Notice the 1000uf Electrolytic capacitor on the input power rails. Also note that we have looped our power from the END of the chain back to the power supply. This will ensure that power is delivered relatively equally for our system. When we start getting into larger installations with hundreds and even thousands of pixels, using multiple power supplies, this stuff gets super important. The longer a chain of pixels is, the higher the resistance of the power rails embedded inside the copper strip. Depending on your installation it is wise to insert power at regular intervals, either from the same of from multiple power supplies. Using high quality appropriate gauge power cables also becomes important when you have more than 1 meter lengths. It's also very important to fuse your LEDs. Because of the amount of amps needed to run even a basic LED setup, you will likely need a hefty power supply. This means that in the case of a short circuit of a single wire, the amp's overcurrent protection will not be tripped. This in turn can result in the LED strip overheating to the point of catching fire! Thankfully, the solution is simple. By installing an appropriately rated fuse for the number of LEDs in the circuit, the installation becomes safer. The fuse will burn out under a short circuit condition even if the power supply is happy to supply the current. With the example of 10 LEDs drawing 600 mA, a 1 amp fuse would do just fine to protect the circuit in the event of an accidental short. Read more about fusing your LED strips. Thanks to Thomas Sebastian for the excellent article and the reminder that safety comes first.